Mahi is one of the major interstate west flowing rivers, along with Tapti River and the Narmada River, of India. The total length of Mahi is 583 km. It originates in the Mahi Kanta hills, from the northern slopes of Vindhyas at an altitude of 500 m near village Bhopawar, Sardarpur tehsil in Dhar district of Madhya Pradesh. Initially the river flows Northwards through Dhar and Jhabua districts of M.P. and then turns left and passes through the Ratlam district of M.P., then turning to North – West, it enters the Banswara district of Rajasthan and flows in South – West directions and thereafter enters the Panchmahal district of Gujarat state. Then the river continuously flows in the same direction through Kheda district of Gujarat and finally falls into the Gulf of Khambhat in Arabian Sea. Mahi river also finds mention in India mythology. In Vayu Purana, this river is also known as Mahati. The name of the river seems to be derived from the lake from which it springs. This is often called the Mau or Mahu as well as the Menda. According to one legend, the Mahi is the daughter of the Earth and sweat of Indrdyumna, the King of Ujjain. 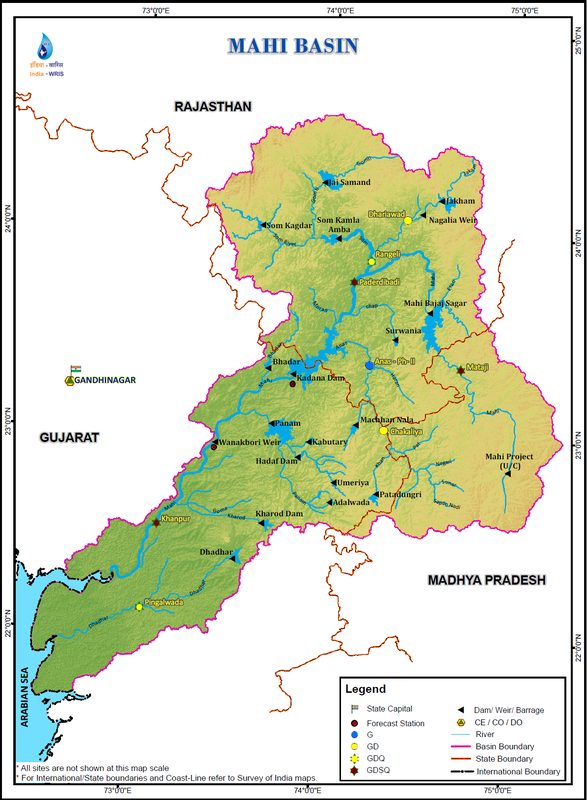 The Mahi basin extends over states of Madhya Pradesh, Rajasthan and Gujarat having total area of 34,842 Sq.km. It is bounded by Aravalli hills on the north and the north-west, by Malwa Plateau on the east, on the south by the Vindhyas and by the Gulf of Khambhat on the west. The state wise distribution of the drainage area is shown in the following Table. This is a right bank tributary of Mahi. Som river rises near Som on the Eastern slopes of the Aravalli hills in the Udaipur district of Rajasthan at an elevation of 600 m above m.s.l. and flows in the Eastern direction to join the main river Mahi on the right bank 6.3 km upstream of Paderdibadi site in Dungarpur district of Rajasthan. Its total length is about 155 km. The total drainage area of Som is 8707 sq.km. Gomti & Jakham are the major right bank sub tributaries of Som. This is a Left bank tributary of Mahi. Anas River rises near Kalmora on the Northern slopes of Vindhyas in Jhabua district in Madhya Pradesh at an elevation of 450 m above m.s.l. and flows in the North – West direction and joins the main river Mahi on left bank in the Dungarpur district in Rajasthan. It has a total length of about 156 km and the total drainage area of 5604 sq.km. This is a Left bank tributary of Mahi. Panam river rises near Bhadra on Northern slopes of the Vindhyas near Jhabua district in Madhya Pradesh at an elevation of about 300 m above m.s.l. 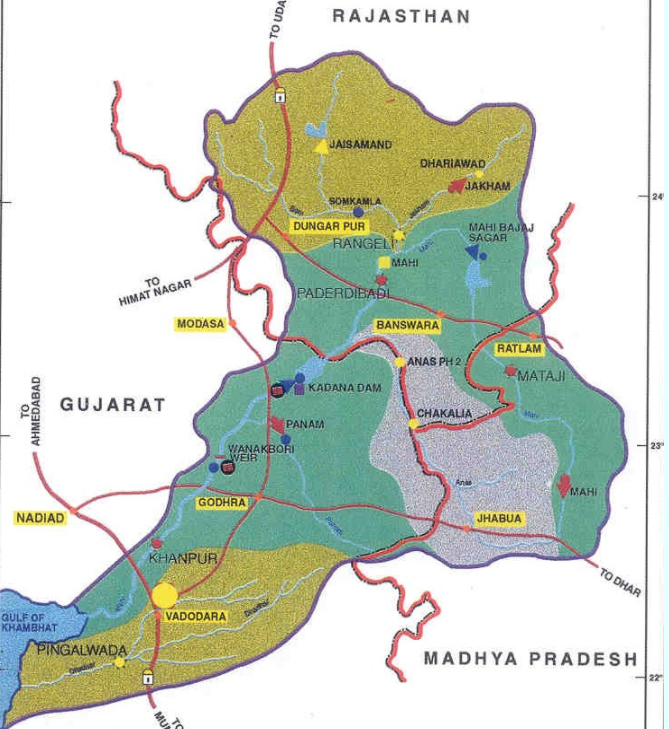 and flows in the North – West direction and joins the main river on the left bank in the Panchmahal district of Gujarat. It has a total length of about 127 km and drainage area of about 2470 sq.km. There are two major hydro-electric projects constructed on Mahi River. Named after Shri Jamnala Bajaj, Mahi Bajaj Sagar Dam is situated 16 kilometres from Banswara town in Banswara district Rajasthan, India. It is the second largest dam in Rajasthan. There are large number of islands within the catchment area of the dam, so Banswara also called popularly called as “City of Hundred Islands”. The Wanakbori dam is established near Wanakbori village. The Wanakbori thermal power station uses the water of river mahi. There are 7 units for the production electricity. Kadana Dam is an earthen and masonry dam on the Mahi River in Mahisagar district of Gujarat, India. The dam was constructed between 1979 and 1989. The silt brought down by the Mahi has contributed to the shallowing of the Gulf of Khambhat and the abandonment of its once-prosperous ports. The riverbed lies considerably lower than the land level and is of little use for irrigation.